Hopefully by now we can all agree that the rent in New York is too damn high. For residents, yes, but also for small businesses. The city is becoming a hollow shell. In a story last week about our dying bodegas, the New York Times reported: "According to a report from the Real Estate Board of New York, the average commercial rent in Manhattan rose 34 percent from 2004 to 2014." And what's coming in to replace the bodegas (and everything else)? National and international chains. "In 2014, the city experienced the largest increase in chain stores in four years, and the sixth straight year of growth in chains." In a story about our dying laundromats, which are vanishing from expensive and hyper-gentrified parts of town, the Wall Street Journal reported that rents are going up--by large percentages--and forcing out the laundromats. In addition, apps like Cleanly and Washio are taking business and killing the mom and pops. 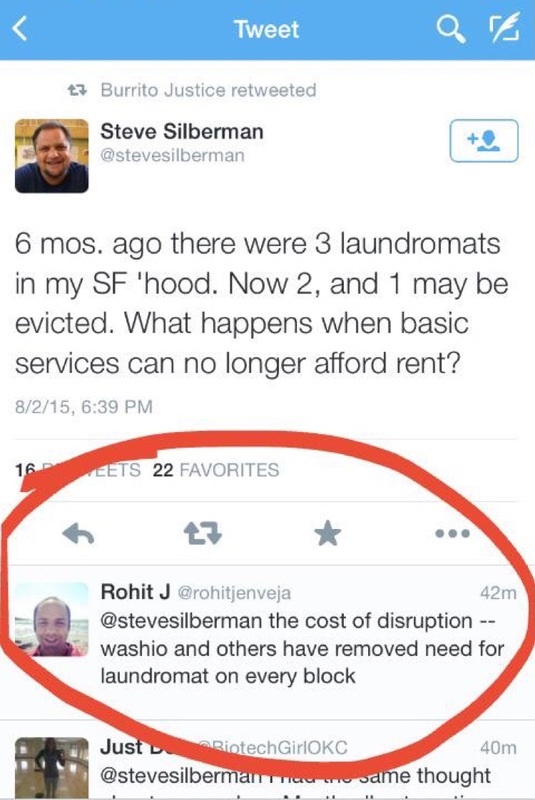 The problem is happening in San Francisco, too, where techies have completely taken over. 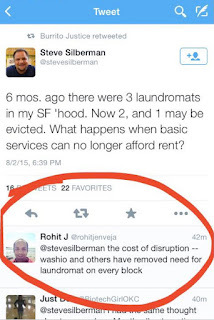 Writes Jack Smith at Tech.Mic, "As wealthy startup employees drive up rent and force out residents who depended on the convenience of nearby laundromats, those laundromats are now closing down... Services like Washio act like handmaids to wealthy young elites." It's not just New York and San Francisco that are suffering from mass corporatization and murder by rent hike, it's the whole country (and the whole Western World). Grub Street just pointed to data that shows that, in another year or two, the majority of America's restaurants will be chains. When landlords know they can get chains to pay high rents, they kick out small businesses--and leave the spaces empty for years. This creates what Tim Wu at The New Yorker called "high-rent blight." Entire neighborhoods are being wiped out and left as ghost towns. Think it's an exaggeration? 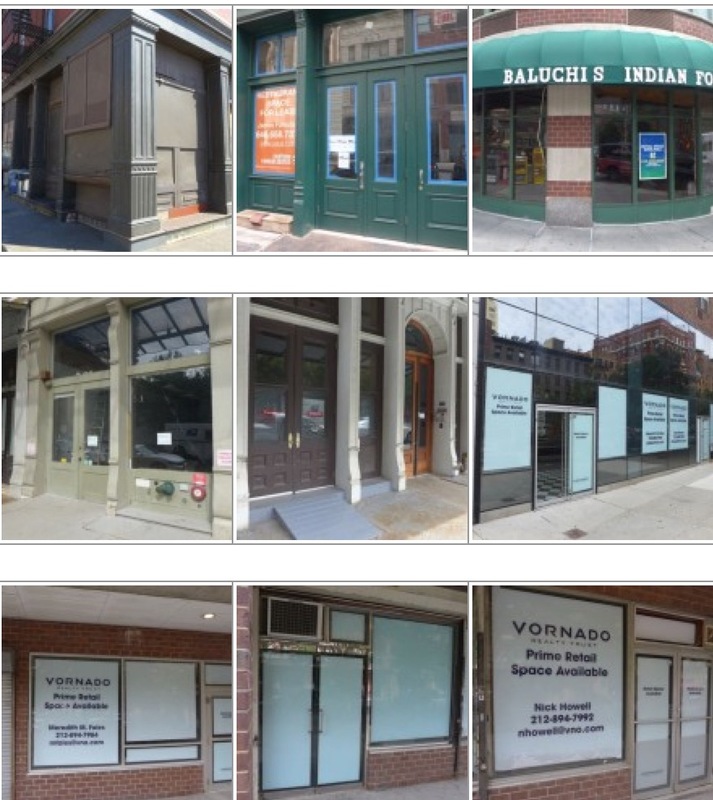 Check out this piece over at Tribeca Citizen -- 100 vacant storefronts, all photographed, one after another, all pushed out by landlords demanding too-high rents. Here's how Alan Ehrenhalt at Governing explains the issue: "Landlords sometimes jack up the rent not because they have a chain tenant in the wings, but because they hope to snare one. The landlords call them 'credit tenants.' In the meantime, there are tax deductions to be claimed. And if the building was a recent purchase, the landlord is paying off the acquisition at interest rates much lower than those that would have prevailed at any time in recent history. In any event, the die-off is real. The question is whether the local government has the power and the political will to do anything about it." Plenty can be done about this problem. And City Hall has the power. But no one is doing it. This is a crisis of culture. It is a crisis of individuality and diversity. 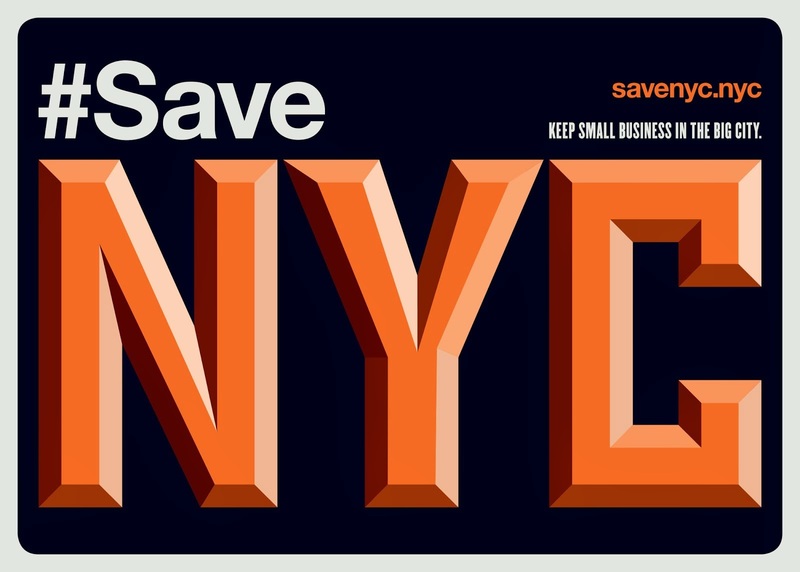 We can't save the world from this mind-numbing, soul-killing wave of monoculture, but we can #SaveNYC. And New York has been a driver of global culture from its beginnings. I've said it before and I'll say it again: Let's put a stop to exorbitant rent hikes on mom and pops by passing the Small Business Jobs Survival Act. Let's stop the spread of chains by passing a city-wide ordinance to control them. Let's fine landlords who leave their spaces open for longer than six months. Here's what you can do to help. It's really not that hard. This city is worth saving. All well and good, but this all ignores an important question: if property taxes are kept low, how do you replace those funds? The city uses them to keep social services operating, streets and sidewalks in repair, parks clean, etc. The money has to come from somewhere; unfortunately, most people will say "not from me!" and "that's not my problem." I pass two laundromats every day. Packed. One of the reasons people moved to these neighborhoods is because of the variety of stores, restaurants and other retail offerings. 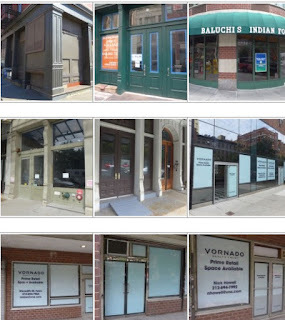 With so many vacant storefronts, people will begin to get disgusted and start to move from these neighborhoods and the commercial landlords will never be able to draw in the kind of tenants they wish to attract. Not to mention, just how many chain tenants can they expect to attract when there are already too many around. There is so much stupidity going around it's mind boggling. Scout can you more clearly explain the connection of low property taxes to high retail rents? Hey Jeremiah, yes the small colloquial bodega's and laundromats are being forced out by high rents, but let's not forget the closing flagship store of Crate and Barrel! Even this huge corporate chain of the larger Home Goods brand decided the rent was "too damn high!" Yes it was on Madison Avenue, the most expensive retail vein of Manhattan, but I think they could have afforded to remain indefinitely if they wanted to just keep paying crazy money. The fact that this kind of business decided to say enough is enough would have me a little worried if I was a big NYC real estate corporation or brokerage house. I think this shows "the sky's the limit" attitude with real estate speculation is capable of getting a reality check even in today's unreal New York! Now we need to change laws that make it easy, and in some cases profitable for these huge firms to leave their buildings empty. These wealthy real estate groups are able to artificially keep rents high because they can ignore the "supply and demand" rule of business and sit on their empty properties endlessly and without conscience or consequence. A new self service laundromat opened recently on Second Avenue near 26th Street. The last wash is 10:30pm and they close at 12 midnight. We really needed one in this neighborhood, I hope they last. Jill, property taxes in NYC are raised every year, due to constant slow inflation and the American preoccupation with the notion that any city or corporation that isn't growing is dying (I don't believe that philosophy, but it seems that most government and business leaders do). Property owners then have to raise business and residential rents (when legally permitted to do so) in order to pay the raised property taxes, continuing a vicious circle of slow inflation. I use Amazon quite a bit. More convenient for me that going to small businesses where whatever I wanted to buy might not be in stock. So the ultimately problem is that consumer wants to use apps like Washio (I will when it is available near me) or Uber or Amazon. It is the consumer that happily shops at Whole Foods, Trader Joes, and Fairways as old school NY grocery stores go out of business. Also as others pointed out city property taxes fund social services, education, and transportation. So the city prefers corporatization for obvious reasons. Bodegas are cash businesses that may not pay all their taxes. But national or global chains are entirely on the books. There is no way to stop what is a national change of transformation. ITunes and Amazon killed the music store and then the video store. The book store is hanging on life support with Barnes and Nobles as the only chain left.